Do you offer flexibility on hire start and end dates? Yes we aim to be as flexible as possible, generally this means you can start and end a hire when you want. We need to make sure the calendar gets booked as much as possible so we ask that you do your best to pick dates that don't leave a short gap on the calendar where the boat can't be booked. If in doubt please enquire and we'll do what we can to suit you. How many nights can we book? 'Gloria' is available for a minimum 3 nights unless the calendar shows that a shorter hire may be available. 'Queenie' can be booked for 1 night (24hrs) and upwards, however single nights are only available at certain times and not on a Friday, Saturday or Sunday. If in doubt please enquire. We keep the same prices all year (infact it costs us more to let the boats out in the winter and colder months). The price you see on our prices page is the total hire fee (apart from coal if you use the solid fuel stove) and includes bedding, towels, diesel and gas. You will pay a security deposit of £350 on the first day of hire which will be refunded in full as long as there is no loss or damage to the boat and contents. We are travelling from quite far to start the hire. Sometimes we can accommodate hirers who want to travel to our base the day before the hire starts and stay on the boat (static), then set off the following day - useful if your hire starts at 10am. This can give time to get some food shopping once you arrive and become acquainted with the boat before you set off the next morning. Please let us know if you are interested in this option - it will cost an extra £60. When our boats are on hire we are on-call so you can get in touch by telephone if you need to at any time. We can either talk you through fixing the problem on the phone or we will come to you. We will always do everything we can to fix any problems and ensure your holiday goes smoothly. Do I need a license to operate the boats? No you don’t, Star Narrowboat Holidays own the appropriate boat license's that are needed. Are the boats easy to operate? The feedback we get from our experienced and non experienced hirers is that both of our boats are straightforward to steer and easy to operate. The canal waters are mostly current free and your cruising speed should not exceed three to four miles per hour so cruising should be steady and relaxed. During the boat handling lesson we will set off together and show you how to moor up (including showing you what knots to use to tie up) and turn the boat around. We will also go through what daily checks you need to make including cleaning the propeller. We will ensure you feel ready to go off on your own. The boats and their contents are insured with Collidge and Partners. Please check the Terms and Conditions for details of insurance. We do NOT provide personal holiday insurance covering cancellation, injury, or loss or damage of personal effects. We strongly recommend that you obtain your own personal holiday and cancellation insurance. How will I know where I can moor the boat? We will advise you on where you can and cannot moor the boat - in general you can moor up where you want to. Is it safe to moor up at night by the canal towpath? There may be some places that we would advise you to avoid apart from that, there should be no problem mooring up where ever you choose (we will advise you about any current restrictions). Will it be cold on the boats if we hire in the winter? 'Gloria' has a solid fuel stove and gas central heating and 'Queenie' has a solid fuel stove so in the winter time you will have a perfectly comfortable experience. We provide 13.5 tog feather duvets in winter and 10.5 tog in the warmer months, we also supply hot water bottles! 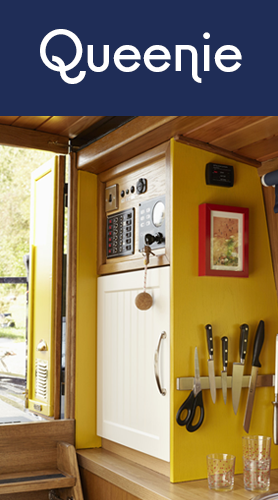 Many people live on their narrowboat all year and with the way we equip our boats we make it possible for you to hire all year. Is it easy to navigate the canals? It is difficult to get lost on the canals if you have a map and you take note of where you are. We will supply you with information and tips on what routes you might take and we will leave you with a copy of the Nicholson Guide to the North West and Pennines, and the Inland Waterways Map of Great Britain, the maps make it clear and easy to locate pubs, bridges and water filling points. If you would like help with pre-hire route planning let us know. Are the boats suitable for wheelchair access? Due to the design of our boats they are not suitable for people who will need to use a wheelchair to enter and use inside the boats. The boats have some scope for people who have limited physical ability - please feel free to get in touch if you would like to discuss whether the boats may be suitable for you. How far can we go in a weekend, week or longer? It depends how much cruising you want to do. In a weekend you could get to Lymm and back with no locks and with relaxing cruising (Lymm is about 5 hrs away from our base) and in a week or just over you could navigate the whole Cheshire Ring which has 92 locks in 97 miles! In 5 days you could get to the Anderton Boat Lift and back. In a 3 week hire you could go further afield to Llangollen in Wales and travel over the Pontcysyllte Aqueduct. Please get in touch with us if you want some advice before you decide to book or not and also have a look at our routes pages. What if we want to keep the boat out longer than the arranged return & vacate time? This can be arranged as long as the boat is not needed for another hire – if you want to bring the boat back at e.g. 4pm instead of the usual 10am return & vacate time we can arrange this at a cost of £10 per extra hour. What if I don’t want to go through any locks? The Bridgewater canal has no locks, so in a short hire you can take routes to the rural quiet of the Cheshire Plains or into Manchester city centre all routes with no locks to navigate. If you do want to take the boat through locks there are plenty on the canals that lead off the Bridgewater canal. We provide all the basic things such as bedding and linen, towels, cooking and eating utensils, toilet paper, cleaning things and drinking water. When you have made a booking we will give you some more information about recommended things to bring. Yes, house-trained pets are welcome for an extra charge of £25 per pet (2 pets maximum). Pets must not go on the furniture and must have their own bedding, food & water bowls. We provide free parking at the marina where the gates are locked at night – the car and it’s contents are left at your own discretion. What if we want to stay on the boat and not move it? When possible we can offer static hire at our lovely mooring at the marina, the rate is £90 per night for 1 double (single night only hires are more expensive). Static hires are a popular option during colder 'off season' times and at Christmas and New Year. Do you offer anything else which might tempt me to book one of your boats?